After a week and a half at home we are on the road again. 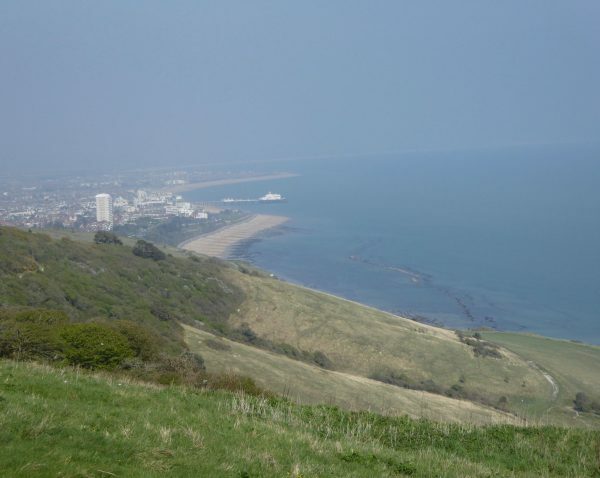 This time heading to East Sussex to stay at Black Robin Farm CL, which is on a hill to the west of Eastbourne and just under a mile from Beachy Head. 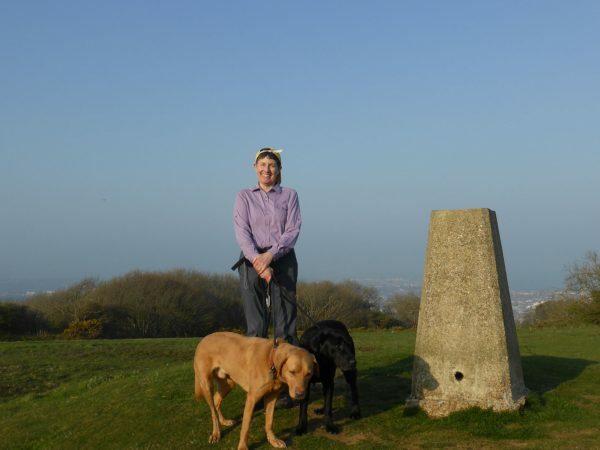 We arrived yesterday afternoon and by the time we were set up had only enough time to walk the dogs on the Downs overlooking Eastbourne. 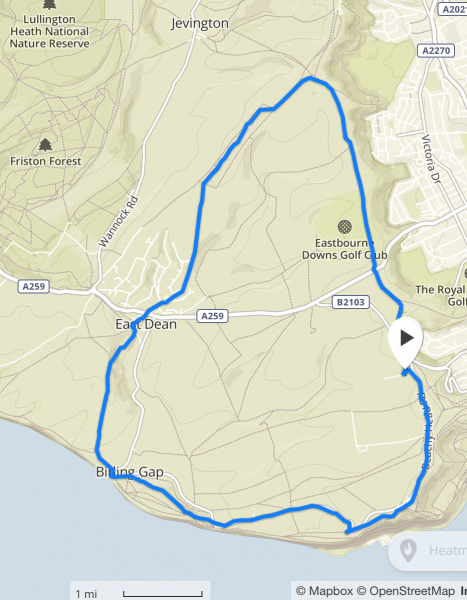 Our walk today is from Black Robin Farm CL; leaving the site we turn right and follow the broad grassy tracks across the Downs above Eastbourne toward Beachy Head. Approaching Beachy Head we arrive at a monument displaying plaques that commemorate Eastbourne Corporation’s purchase of the Downs, from Beachy Head to Folkestone, in 1920 for the preservation of the amenities. I recently read that the Council proposed selling a number of tenant farms on this area of the Downs at the end of last year, including Black Robin Farm. Council tenant farms provide a vital route into agriculture for those who do not have a family farm or are part of the landed gentry. To my mind it is important that such routes into farming remain. 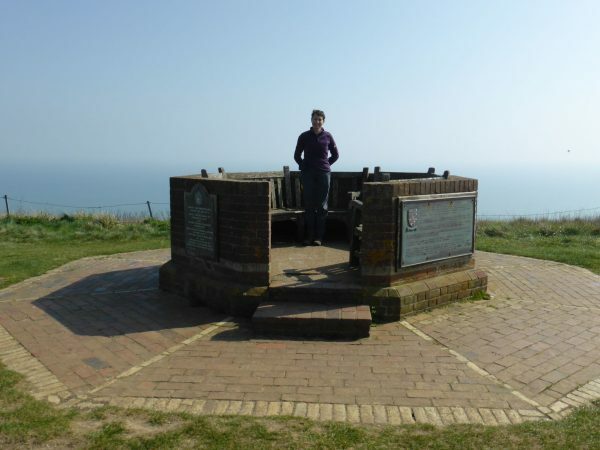 Just opposite the Beachy Head pub is a trig point. To be honest this is not a spot that I ever thought I would visit. Lynnie tells me I am hundreds of yards from the edge, but I am still a bit wobbly and it is a blustery day and if I did not have Dexter and Crosby to weigh me down I could be blown over the edge! A bit further along and worryingly close to the edge is the Watch Tower. Lloyds of London used this location from 1877 for signaling. It was originally leased from the Duke of Devonshire and then in 1896 Lloyds rebuilt the tower and used it until 1904. Only part of the structure remains but it provides (so I am told) extensive views out to sea. It also has a commemorative plaque to PC Harry Ward, the transcript of reads “This plaque is in memory of P.C. Harry Ward, B.E.M. E.R.D. 1912-1974, the Downs Ranger who patrolled Beachy Head on his horse for many years before retiring in 1966. On numerous occasions he risked his own life attempting to save others”. It is a stark reminder of the tragedies that are all too often associated with this location. 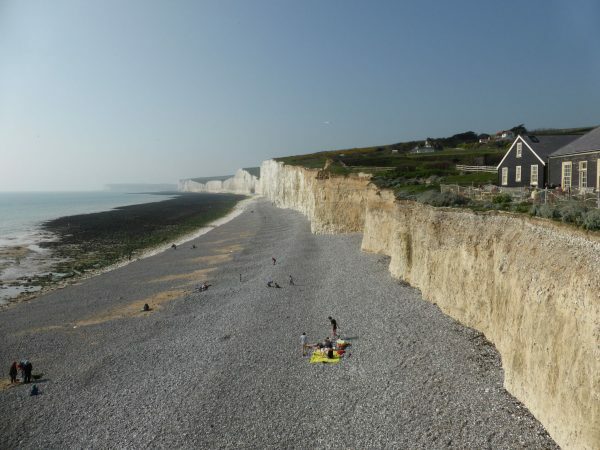 We carry on along the coast towards Birling Gap; I am a bit uncomfortable being so close to the edge. Anything within half a mile is too close for my liking! Lynnie is keen to visit Belle Tout Lighthouse, so she heads up there whilst I remain inland admiring the view over the Downs. When built in 1834 this lighthouse was 100 feet from the cliff edge, but by 1998 it was just 50 feet from the edge so in 1999 it was moved, brick by brick, further inland. From the outset the lighthouse was not an overwhelming success. Its location on the top of the cliff meant that when a sea mist came in it was not visible; a major flaw for a lighthouse, and when the cliffs started to erode around it the rocky outcrops blocked the lights visibility to some shipping. 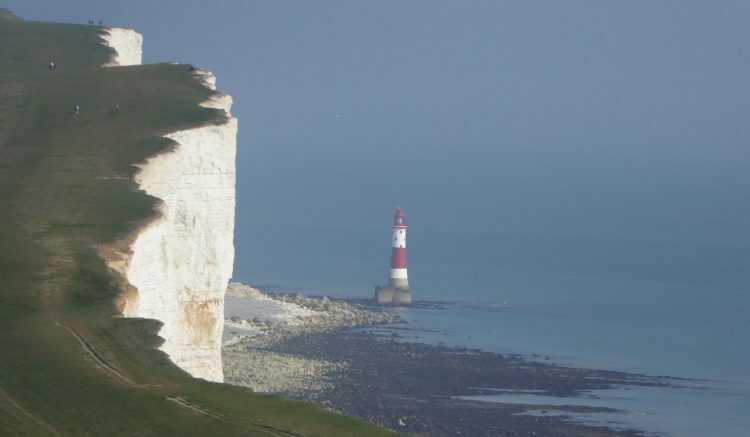 So a new lighthouse was built at the bottom of the cliffs, the iconic Beachy Head Lighthouse. 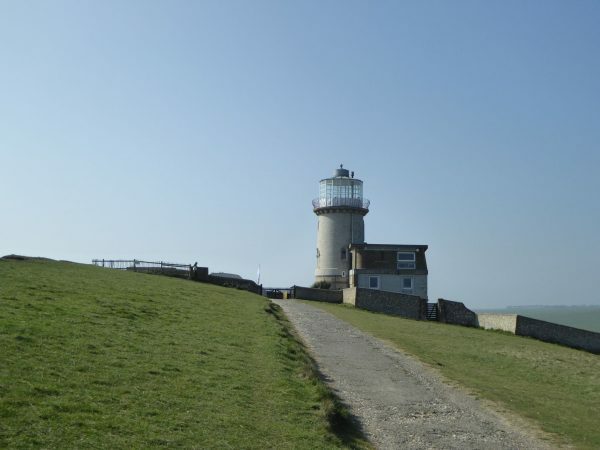 Trinity House sold off Belle Tout Lighthouse in 1903 and from hereon the history of the lighthouse becomes even more interesting. It went into private ownership, which resulted in upgrading the building. Then during World War II it was damaged by Canadian Troops shooting at wooden silhouettes of tanks running on rails to the east of the building. In 1948 the Council took ownership of the building and restored it. The lighthouse was central to the BBC’s 1986 “The Life and Loves of a She-Devil”, a programme I recall watching, I find it difficult to believe that was thirty years ago. Then came the physical moving of the building. 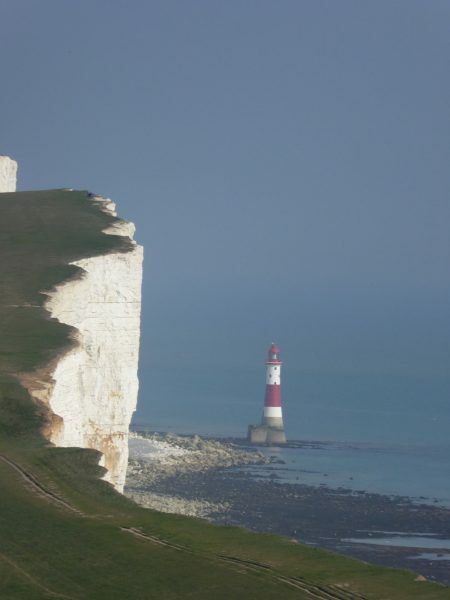 Beachy Head Lighthouse, below the cliffs, often features in pictures and has striking Red and White hoops. In 2011 Trinity House announced they could no longer afford to repaint the red and white hoops, therefore, a local group raised the £27,000 needed for the work. Part of me believes the owners of such a building should maintain it in all its glory, but another part thinks it is wonderful that people who care will step in to maintain such a landmark. From Belle Tout Lighthouse we follow a path (not the coastal path) to Birling Gap, where we briefly stop to look at the old Coastguard buildings. From here there is a stunning view of the Seven Sisters as they spread out towards the west. Resuming our walk we pick up the coastal path going west, this climbs out of Birling Gap. After a couple of hundred yards we leave this path to join a footpath heading back in land over Went Hill to East Dean. With my back to the cliffs I feel a lot more comfortable. 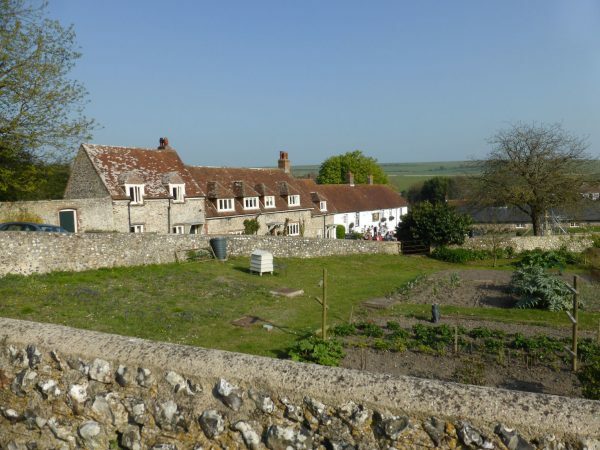 East Dean is a pretty village with a popular pub located on the green, but we still have a few miles to cover so we avoid the temptation to stop for a sharpner. Walking through the village we come to the main A259, which we cross to follow a footpath as it runs through a housing development. Passing the houses we climb steadily uphill. Eventually we leave the houses and join a path that crosses over fields to Willingdon Hill. 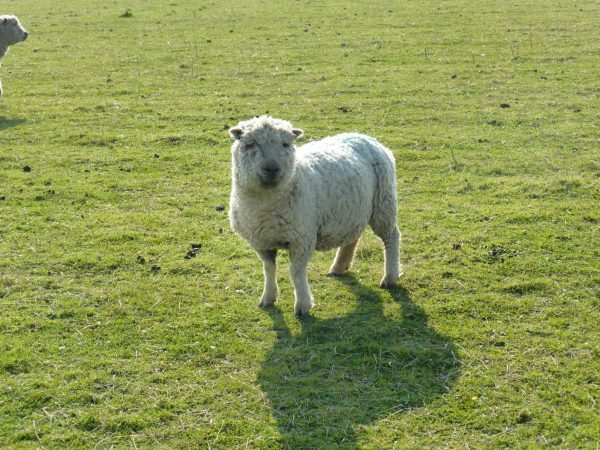 Along the way Lynnie identifies a Southdown sheep, apparently she has not got a picture of this particular breed! 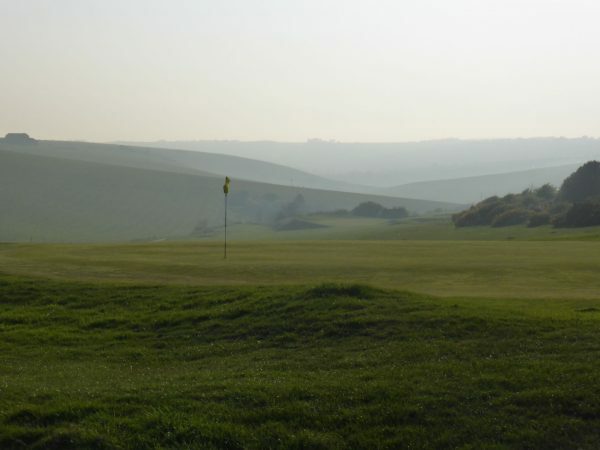 After passing over Willingdon Hill we carry on to a crossing of paths and turn right to join the South Downs Way, this route takes us past Eastbourne Downs Golf Club. This looks an interesting course and would be extremely challenging when the wind gets up. 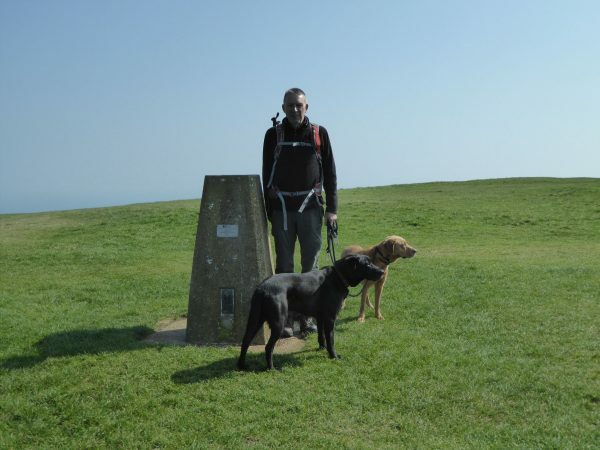 After passing the golf course we cross the A259 and head back to Robin Hill Farm, stopping briefly for a photo opportunity at the trig point above Eastbourne. 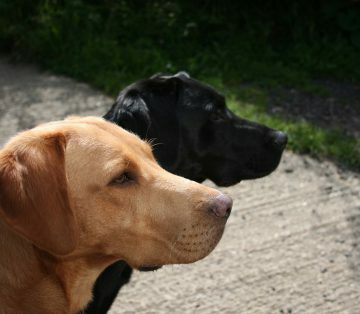 Dexter and Crosby have become accustomed to stopping at trig points to have their picture taken, they never look very excited! 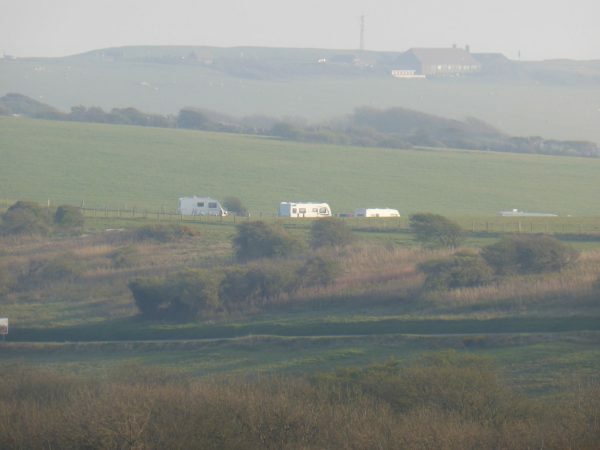 As we walk back to Robin Hill Farm CL the Coachman comes into view with the Beachy Head pub in the distance behind it. It makes my knees knock to know we are within a mile of the edge! 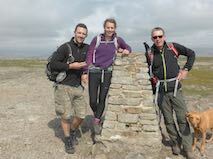 Our walk has covered over ten miles and has been a cracking introduction to this area.